The world of motorcycle helmets is like an evil weed in the flower bed of life. The more you dig to find the roots and try to take out the problem plants, the more you destroy the habitat of the growing wonders you wish to enjoy. I'm relating this directly towards the multitude of "weed" helmets out there. You know, the ones that look good in the pictures, and the price tags look about what you'd want to pay, but in reality, this "weed" helmet does little more good than becoming your next hanging flower pot. With that in mind, let's take the I-volution Matte Black Full Face Motorcycle Helmet for example. Unlike many of the brands you see online and on auction websites, I-volution has a real website and a dealer network. This means that even though they're inexpensive, there is at the very least a place where you can bring any concerns about quality to a person face to face. Besides just being a run-of-the-mill full face helmet, these guys are streamlined to reduce wind noise and are well vented. 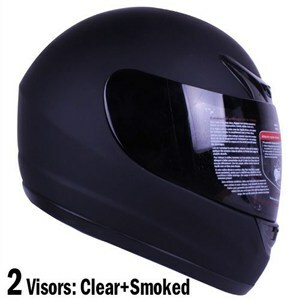 They are DOT approved, and to make the deal a little sweeter, each one comes with smoke and clear visor. It's not the best helmet out there, but hey, for the price it doesn't hurt to have one around for a spare.